Berkeley High School's principal says the student behind a hate-filled racist rant left on a computer in the school's library that prompted a massive walkout and protest has confessed. BERKELEY, Calif. -- Officials say they've found the student who's accused of leaving a hate-filled racist rant on a library computer at Berkeley High School. The message compelled about 1,000 angry students to walk out of class and march through the city. 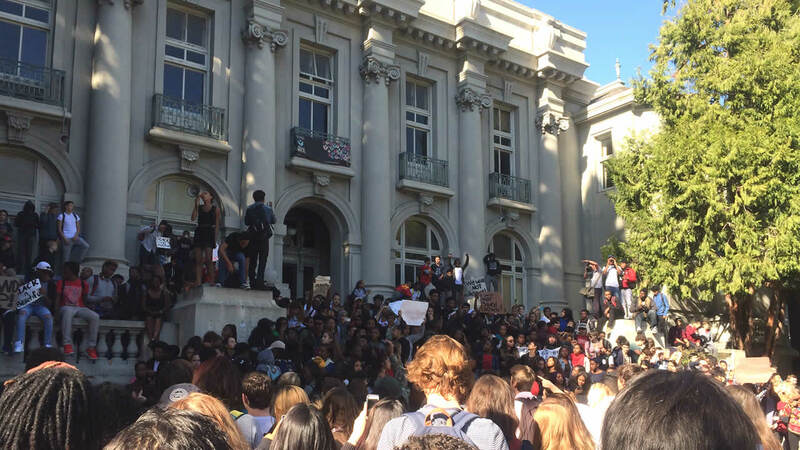 A mass demonstration took place in Berkeley, Calif. on Thursday, November 5, 2015 after a racist message was discovered at a Berkeley High School library computer. Early Thursday evening, Principal Sam Pasarow announced that the student had confessed. "I think the student is really aware of what this caused on our campus today and hwo much fear it caused and how much chaos it caused on our campus," he said. Officials have not yet named the student nor given any personal information about them. They say the student was interrogated and admitted to doing this only after a technological forensic analysis was done on the computer. A high school that prides itself on diversity was thrown into the struggle for rights and justice on Thursday. The protest was fueled by what was discovered there Wednesday on a computer in the library. 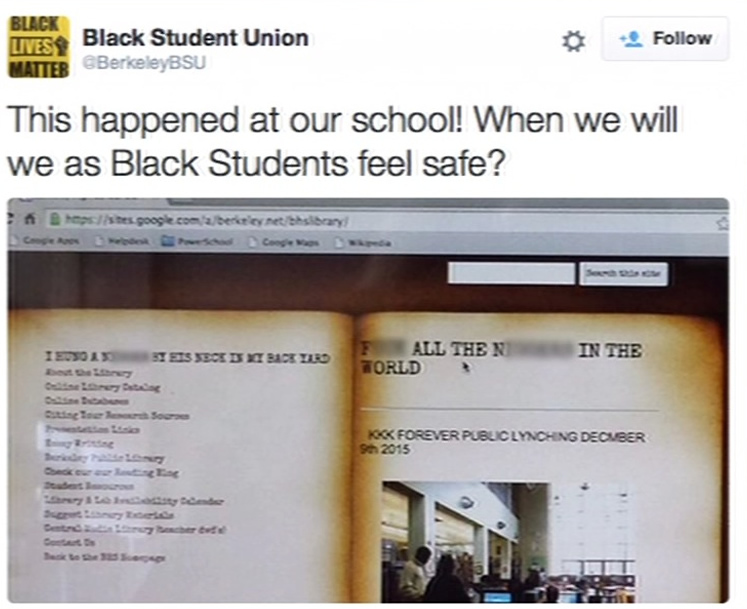 A tweet by Berkeley High School's Black Student Union shows a screenshot of a racist message left on a school library computer on November 4, 2015 in Berkeley, Calif.
"An image on the screen that was a mock-up made to look like a web page," said Mark Coplan with Berkeley Unified. "It was not an electronic document at all, it hadn't been sent anywhere." A student took a screen shot of the page. On it were offensive messages towards African Americans, threatening to have a public lynching on Dec. 9. Around 9 p.m., students and parents were notified via email. "Yesterday I was submitting college applications at 8 at night and at 9:30 I started fearing for my life on Dec. 9, I'm afraid I'm not even going to make it to Dec. 10," said student Carena Ridgeway. During the protest, one student on a megaphone said, "You better start doing it so everybody feel the need to stand up." Outraged, the Black Student Union at Berkeley High called for a rally, and on Thursday morning, close to 1,000 students this morning. First they marched around the school, then to city hall, and finally they took their voices to UC Berkeley, the cradle of the free speech movement. "I just took it as a sign, like a message. Like, racism isn't over," said student Tarik Brooks. "People think like, Obama got elected. But racism is not over." "In a lot of ways it's like a hate crime or a terrorist attack," said student Elijah Davis. Because it is considered a hate crime, the matter is being investigated by Berkeley police.